Denis Ssebuggwaawo was born at Kigoloba in Bulemeezi County, about the year 1870. His mother, Nsonga, was a Musoga who had been carried off as a child by Nkalubo Ssebuggwawo, the martyr’s grandfather. When she grew up, Nkalubo gave her to his son Kajansi, who had nine children by her, including three sets of twins. The first child, a boy, died as an infant. 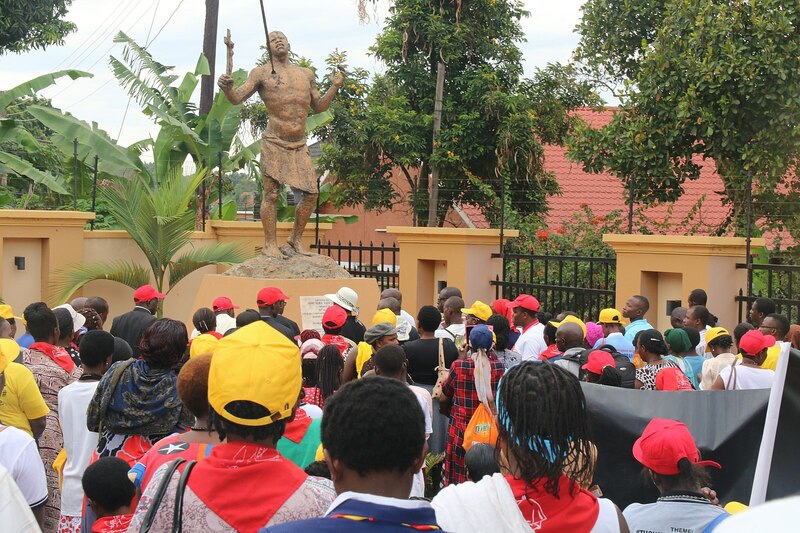 He was followed by the first pair of twins, the martyr Denis Ssebuggwawo (Wasswa) and Isaac Kajane (Kato), the names Wasswa and Kato being traditional names in Buganda for male twins. Not long after this event, Nkalubo Ssebuggwawo was put to death by Kabaka Muteesa, and Kajansi, his son, transferred himself and his family to Bunono, in Busiro County, where the family estates were situated. Here the rest of the children were born, and here the young Ssebuggwawo and his twin brother Kajane grew up until, on the accession of Mwanga, they were presented at Court by their fellow clansman, Mukasa the Chancellor, who at the same time gave the Kabaka his own sons Mwafu and Kasamitala. The four lads, as members of the privileged Musu Clan, were posted to the private section of the royal enclosure, where they came under the immediate command of Joseph Mukasa, the Majordomo. The Chancellor’s son, Mwafu, who was a pretty boy, quickly succumbed to the blandishments of his royal master and became Mwanga’s favourite plaything. This fact, revealed by Daudi Nyondo, is of considerable significance and is the essential clue for a proper understanding of the events of 25 May 1886. The latter was a great favourite of the Kabaka; he would always stay with his master during the day hours or during the night; in fact he slept by the side of the Kabaka’s bed, to be always at hand and within call whenever the Kabaka would require him. He had, however, been made chief and quitted the palace by the time of the persecution of Christians. During his period at the palace, Kajane made desperate efforts to convert the Kabaka himself, as is clear from Mwanga’s own words, quoted elsewhere/ and from Miti’s account of his arrest. The other twin, Ssebuggwawo, showed no less zeal. He proved an apt pupil, eagerly seized upon every opportunity for instruction, and tried to pass on to his companions whatever he had himself learnt. Far from being deterred by the death of his instructor, Joseph Mukasa, Ssebuggwawo prepared to follow him on the road to martyrdom and was amongst the pages who slipped away from Court to the Catholic mission to ask for baptism on the night of the 16 November 1885, the day after Joseph’s martyrdom, when he received the name Denis, the great patron of France. 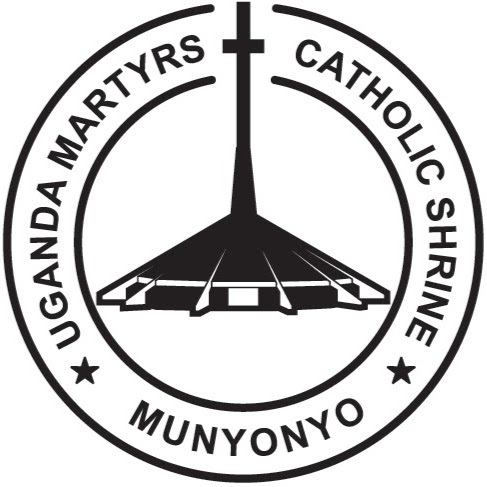 Nor did the young neophyte relax in the slightest his efforts to convert his companions: indeed it was his attempt to convert Mwafu, the Chancellor’s son and the Kabaka’s favourite, to Christianity and a decent way of life that finally fanned Mwanga’s smouldering anger against the Christians into the flame that consumed him and many of his companions. 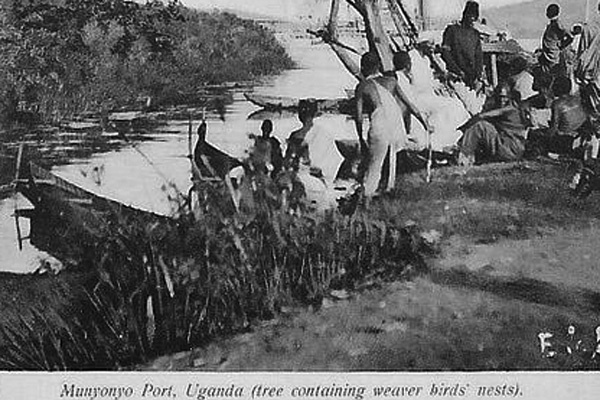 On the afternoon of Tuesday, 25 May 1886, Mwanga suddenly decided to go hippopotamus hunting and, sending the young Kizito ahead to order the canoes, left his palace at Munyonyo at about two o’clock with some twenty attendants. No hippo was sighted; so after shooting at a few birds the royal party returned to the lake-shore at about five o’clock. And on his way back, another tragedy struck as he lost his modern rifle to the lake. ‘They did not know that you were out hunting,’ replied one of his companions, probably Andrew Kaggwa. ‘If they had known they would have been here.’ Mwanga refused to be placated. ‘I met Ssebuggwaawo and Mwafu on the road, near Ttaka Jjunge. ‘There!’ exclaimed Mwanga. ‘They have gone to Kisuule’s place to learn religion. Am I your Kabaka? Or does Buganda belong to the white men? All the way back to the Palace, Mwanga continued to grumble in the same vein. ‘Yes, I have been instructing him in the Christian religion,’ replied Ssebuggwawo. ‘So, it is you that are responsible for trying to convert him?’ ‘Yes, I am the one that instructs him.’ Kabaka Mwanga, by now in a raging temper, picked up the spear Muwabutwa (which gives poison), a small spear which had belonged to his father Muteesa, and savagely belaboured the boy, beating him about the head, neck and chest, until the spear broke in his hand. Then, seizing the stunned and prostrate boy by the arm, he dragged him out of his own courtyard, through the ivory court, into that of the audience hall, shouting wildly all the while for men to take Ssebuggwawo and kill him and uttering threats of death to all Christians, which brought a momentary panic amongst the younger pages, who were gathered there taking counsel with their leaders. The official executioners were not at hand, so the two Muslims, Kyayambadde and Mberenge, Mwanga’s constant companions, ran to relieve their master of his victim and dragged the martyr out of the royal enclosure. The first object of Mwanga’s violence on this memorable evening, the young page Denis Ssebuggwawo, was not, as the Kabaka had ordered, killed at once, but was lying in custody at the house of Mpinga Kaloke, one of the official executioners. 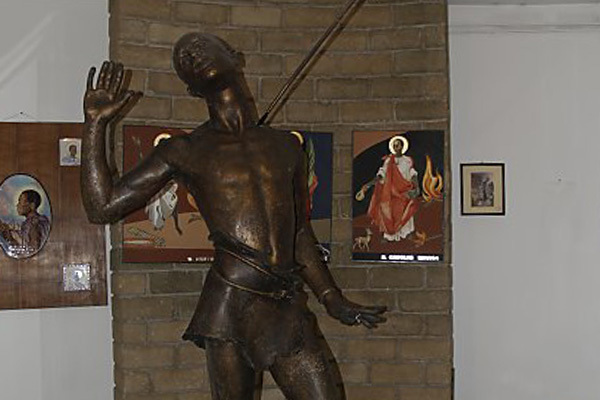 Kyayambadde and Mberenge, after relieving their master and boon companion of his stunned and bleeding victim, dragged Ssebuggwawo towards the main gate where they were seen by Simeon Nsubuga, himself to suffer mutilation for his faith. In the square outside the gate, they stripped the martyr of his clothing and then took him along the road to the left,’ past the residence of the Guardian of the Cord. As neither of the Muslims was armed, Kyayambadde ran into the house where Mberenge lodged and seized a knife that was used for cutting up the Kabaka’s meat. The occupants of the house objected, saying, ‘What! Are you proposing to use a butcher’s knife on a man?’ But the Muslim insisted on taking the knife and, together with his companion, went off with the intention of trying to behead the martyr with the knife. Before they could carry out their horrible plan, one of the professional executioners, Mpinga Kaloke, seems to have arrived on the scene and relieved them of their prisoner. This man took Ssebuggwawo to his house; he did not kill him at once, but let him spend the night there. Next morning, Mpinga ordered his men, Mattembe and Mulyowa, to put Ssebuggwawo to death, and they killed him in a wood adjoining the enclosure of the executioners. They took knives, not spears, with them; which fact led people to believe that the victim was hacked to pieces. 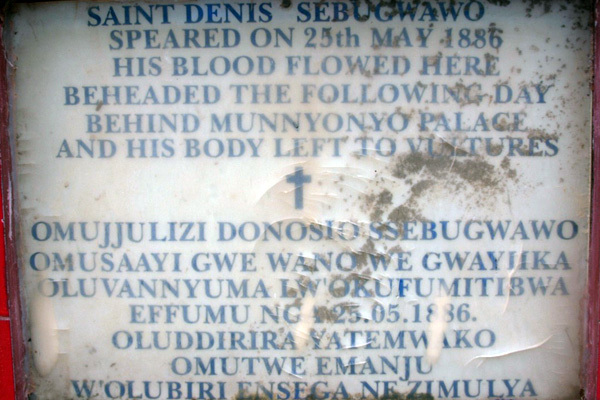 Denis Ssebuggwawo was the first to die in the main outbreak of persecution on the evening of 25th May 1886. From there King Mwanga seriously started the Christian persecution which, took the lives of 22 Catholic and 23 Anglican Martyrs.